And yet enter we do, into Segers’ haunted valleys carved from roughly hewn terrain, a world defined by rocks which the art historian and critic Carl Einstein once wrote “betray a despair that paralyses like a cramp.” These words aptly describe the sense of dramatic isolation present within the work of Hercules Segers (c. 1589–c. 1638), the seventeenth century painter and printmaker who was born in Amsterdam and who left behind a relatively small but fascinating oeuvre comprised of 11 known paintings and 183 prints, derived from 54 copper plates. The subject of interest from art historians from the nineteenth century onwards when the British Museum and Rijksmuseum both acquired important works, Segers’ remarkable printmaking practice has recently been the subject of renewed attention via creative intervention, and rigorous scholarly enquiry. Within the former category exists the multi-disciplinary installation Hearsay of the Soul created by film director Werner Herzog for the 2012 Whitney Bienniel. For this project images of Segers’ etchings were projected greatly enlarged and accompanied by experimental music performed by composer/cellist Ernst Reijseger. When devising the work Herzog was outraged that Segers, who he describes as an early father of modernism and also the author of a “strange ecstatic vision,” was still so relatively unknown to a non-specialist audience. Hearsay of the Soul sought to redress this gap in awareness. 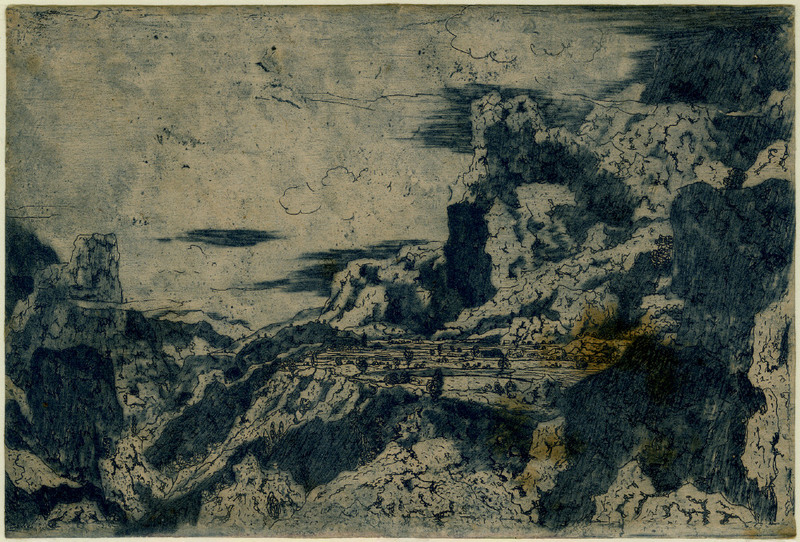 Indeed it was after hearing the impassioned ravings of an artist friend who had encountered Segers’ work for the first time when this project toured to the Getty Institute, that I also became introduced to the singular work of Hercules Segers. In 2012 Segers’ prints formed the sole focus of an exhibition held at the British Museum, curated by An Van Camp (Curator, Dutch and Flemish Prints and Drawings, British Museum) and drawn from the museum’s significant collection of his work. The majority of prints in the exhibition had never before been exhibited, and Van Camp worked with conservators to explore the technical secrets of Segers’ etchings that made them so unusual for their time, and so refreshingly modern in appearance even by today’s standards. Segers was highly innovative and actually invented the etching technique of lift-ground or sugar-lift. The extent to which he experimented with colour in printmaking was also novel for the first half of the seventeenth century, as he printed with coloured inks on tinted papers, or in some instances fabric supports prepared with different colours. He also applied colour by hand to some of the printed images, frequently combining an artful mix of these various strategies to create startlingly unique works. Click here to read Van Camp’s detailed study that accompanied the British Museum exhibition. Through these innovations Segers developed a technique and style that was completely unparalleled during his own age, and perhaps it is for this reason that other artists, including his younger contemporary Rembrandt van Rijn (1606 – 1669), so admired and collected his work. 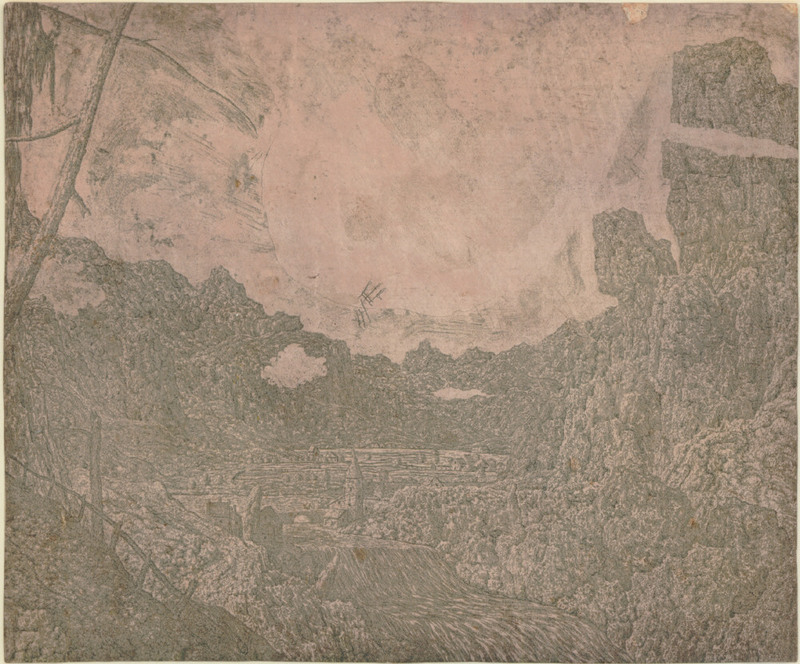 The works illustrated here indicate the extent to which Segers altered one print from the next through his experimental approach. So different is each impression that it takes a moment to register that both versions of River Valley with Waterfall pictured below, are actually printed from the same plate. The hatched marks in the sky area of the darker version above (HB 22.II.g) to contemporary eyes may appear as idiosyncratic indications of the Segers’ experimental process, adding to the appeal of the work. Yet it is difficult to know how such evidence of technical experimentation would have been received during the artist’s time. Along with some fellow artists who were no doubt fascinated by his etching process, Segers’ prints were acquired by a small group of discerning collectors but are not likely to have been widely distributed. For Segers the primacy of the image was clearly prized over seamless technique, and any imperfections became woven into the fabric of the images. Thus evidence of process and discovery are inherent to his printmaking. Segers’ bold approach results in the cold, mineral beauty of his work that continues to resonate with contemporary audiences. 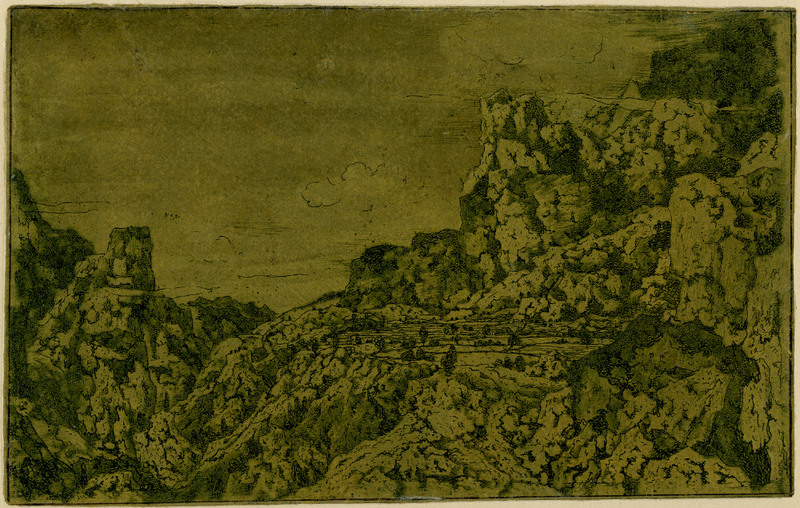 Both impressions of Rocky Mountains with a Plateau (pictured below) exemplify the strange emptiness of his images, which are nevertheless rendered with detailed minutae. Towering rocky cliffs and precipices surround a flat plateau littered with small trees and a tiny house or barn-like structure. As is characteristic of his work, any signs of human habitation are minimal and are dwarfed by the vastness of their geological surrounds. Segers invents a thoroughly inhospitable environment, and one gets the sense that the exposed house and its inhabitants could at any moment be swept away in a storm, or crushed in a landslide. These works seem to linger on the edge of fantasy and reality, in a space where man has no dominion over nature, and dwells upon precipitous grounds. Through creating unique and inimitable prints, Hercules Segers tipped the existing conventions of printmaking, which generally focused on generating identical impressions, firmly on its head. In doing so he made extraordinarily memorable and original images that rightly deserve to form the focus of renewed study and appreciation. 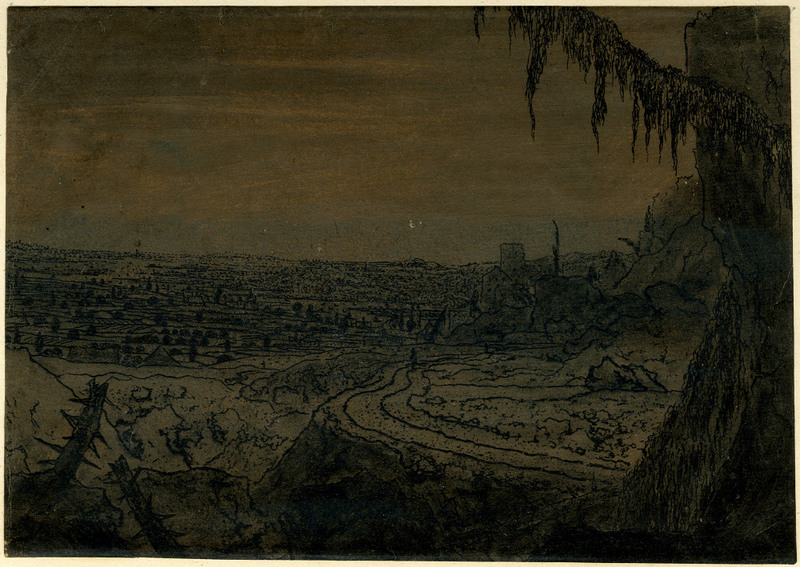 An Van Camp, Hercules Segers and his ‘printed paintings’ British Museum, 2012, n.p. Click here for full essay. Lift-ground is also commonly known as sugar-lift etching and involves the artist applying a sugar based solution to the plate, which is then covered with an acid resistant varnish or ground and submerged in warm water which causes the sugar solution to dissolve and lift off off the varnish, exposing areas of the plate where the design had been applied. These areas are then usually aquatinted to hold the ink, etched in acid and inked and printed as normal. 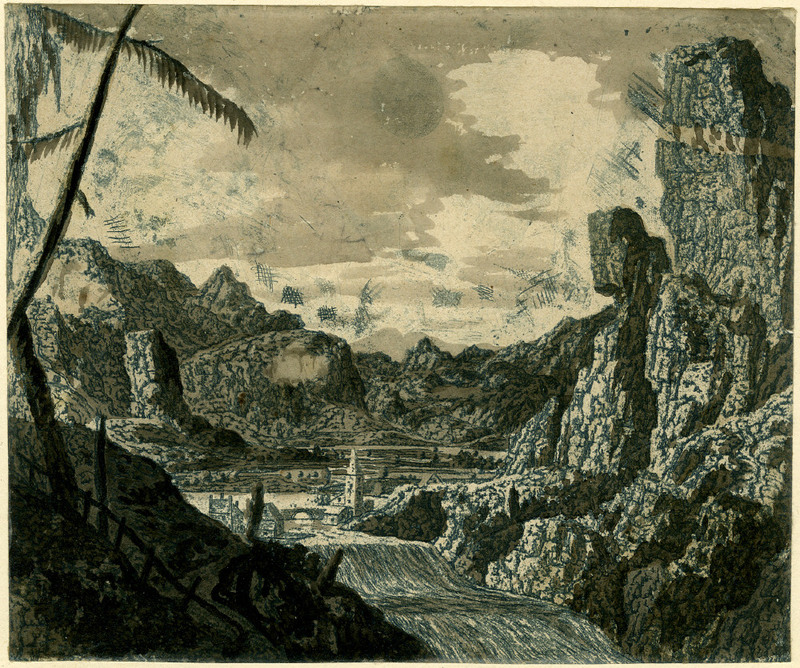 Segers did not however apply aquatint which was a later invention, for an analysis of Segers’ use of lift ground see: An Van Camp, Hercules Segers and his ‘printed paintings’ British Museum, 2012, n.p. Click here for full essay. Tags: art, art criticism, Art History, British Museum, contemporary art, design, etching, Hercules Segers, printmaking, Werner Herzog, Whitney Museum. Bookmark the permalink. 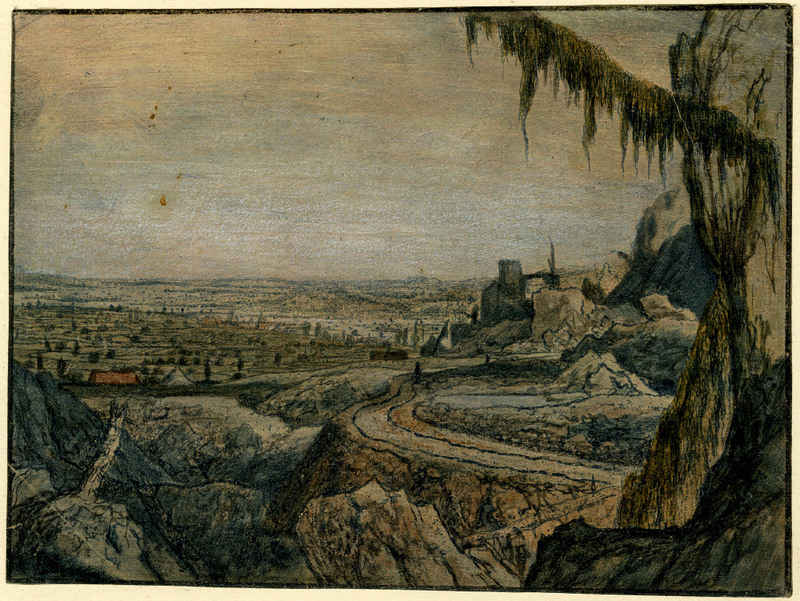 I have really enjoyed reading this account of Hercules Segers’ prints – and am inspired to read further on this intriguing artist. Many thanks Alison, so glad you enjoyed. I was inspired when I came across his work also, remarkable prints.